The Merrick Pet Care Company was founded by Garth Merrick in 1988. The company began with the release of a line of dog treats that promoted oral hygiene, but it has since expanded into a line of handcrafted, all-natural pet foods made using the highest quality ingredients available. For many years, Merrick produced and manufactured their own products. In 2015, however, the company was acquired by the Nestle Purina PetCare company, a subsidiary of Nestle and the largest manufacturer of pet food products in the United States. Merrick products are currently made by the Nestle Purina PetCare company. This company is the second-largest manufacturer in the world and the largest in the United States. Though Nestle Purina PetCare sells their products all over the word, most of the products sold in the U.S. are also produced in the U.S. According to the their website, all of their products are safely cooked in the USA, specifically in five-star manufacturing facilities located in Hereford, Texas. Since its founding 1988, the Merrick Pet Care Company has made a name for themselves in the premium pet food industry. Over the past twenty years, they have maintained their devotion to producing high-quality, nutritious diets for pets and they achieve this goal through the use of fresh, high-quality ingredients. According to the brand website, Merrick sources their ingredients from the best producers in the world. Though they do not get any of their ingredients from China, some of their ingredients do come from countries other than the U.S. For example, they get some of their lamb from New Zealand. No matter where their ingredients come from, they subject themselves to rigorous safety checks prior to production and every completed product is tested prior to sale. In July 2010, the FDA issued a recall for certain runs of Beef Filet Squares and Texas Hold’ems dog treats due to potential salmonella contamination. In January 2011, the FDA issued a recall for Jr. Texas Taffy pet treats due to potential salmonella contamination. In August 2011, the FDA issued a recall for Doggie Wishbone Pet Treats due to potential salmonella contamination. Merrick dog food products are sold in most major pet food stores as well as local chains and some specialty pet stores – you can also purchase them from online pet food retailers. Merrick occasionally offers coupons on the company website and you may also be able to find Merrick dog food coupons from individual retailers. The Merrick brand is a high-quality brand, so you should be prepared to spend more than you would for an average kibble. The different product lines of Merrick dog food vary in price with the Backcountry line being the most expensive and the Classic line being the most affordable. The Backcountry line of dry foods ranges from $63 to $80 for a 22-pound bag. For 25-pound bag of Classic dry food you will spend between $35 and $68. You can purchase 13.2-ounce or 12.7-ounce cans of wet dog in cases of 12 for $30 to $45 which gives you an average price of around $3.10 per can. When it comes to their dog food products, they offer a generous variety – more than 125 different recipes. Merrick dog food products are divided amongst four different product lines plus a dedicated line of dog treats. The Classic line of products features real meat as the first ingredient with whole grains and fresh fruits and vegetables. The Grain-Free line is made with real whole foods and grain-free carbohydrates as well as real deboned meat as the main ingredient. The Backcountry line actually includes two categories – an all-natural and grain-free line of protein-rich kibbles infused with freeze-dried raw pieces and a line of freeze-dried recipes. There is also a dedicated line of Limited Ingredient Diets for dogs with food allergies or sensitivities. All four of Merrick’ product lines include both dry food and canned food options. The Merrick company follows the tagline, “whole health made right”, so you shouldn’t be surprised to learn that they use a variety of wholesome ingredients in their formulas. Their pet foods all start with a high-quality source of animal protein that is supplemented with digestible carbohydrates, many of which are gluten-free and grain-free. They don’t use any corn, wheat, or soy ingredients and all of their formulas are free from artificial additives. Simply put, their products are hard to beat when it comes to quality. This Classic Real Chicken & Green Peas with Ancient Grains Recipe is a high-quality source of balanced nutrition for adult dogs of all breeds. This formula features real meat as the first ingredient, supplemented with whole grains and fresh vegetables. Not only is this recipe protein-rich and full of natural flavor, but it is highly digestible as well. This formula contains 60% poultry and fish ingredients with 20% whole grains – the remaining 20% is made up of fresh fruits and vegetables as well as vitamin and mineral supplements. There are no corn, wheat, or soy ingredients or artificial additives. As promised, the first ingredient in this formula is deboned chicken. Chicken is a meat- and protein-rich ingredient, not to mention a complete protein – that means that it contains all of the essential amino acids your dog needs. One thing to be aware of is that fresh meats contain up to 80% moisture by volume. So, when the dog food is cooked, much of that moisture will be lost and the total volume of chicken protein could be lower. Because chicken meal is the second ingredient in this Classic Real Chicken & Green Peas with Ancient Grains Recipe, however, that won’t be a problem. Chicken meal has already been cooked to remove moisture so it is a highly-concentrated source of protein. After the chicken and chicken meal come peas as the main carbohydrate – there is also brown rice, barley, oat meal, and quinoa on the list. These whole grains are generally considered digestible for most dogs, though they could cause a problem if your dog is sensitive or allergic to grains. These ingredients provide carbohydrate energy and dietary fiber. There are also fresh fruits and vegetables included which act as supplementary sources of fiber as well as natural sources for key vitamins and minerals. Chicken fat is the main source of fat in this formula and a highly nutritious one at that. It is supplemented by flaxseed oil and some natural fat in the salmon meal to provide a balance of omega oils. This Classic Real Chicken & Green Peas with Ancient Grains Recipe is formulated to meet the nutritional levels established by the AAFCO Nutrient Profiles for maintenance. Overall, this Classic Real Chicken & Green Peas with Ancient Grains Recipe is an excellent source of quality nutrition for adult dogs. Not only is it loaded with animal protein from the chicken and chicken meal, but there are several supplementary sources of protein like turkey meal, salmon meal, and chicken liver. With peas as the primary carbohydrate it is possible that there is a measurable amount of plant protein in this formula though, at 30% crude protein, it is unlikely to be a problem. The only potential problem with this recipe is the inclusion of whole grains. 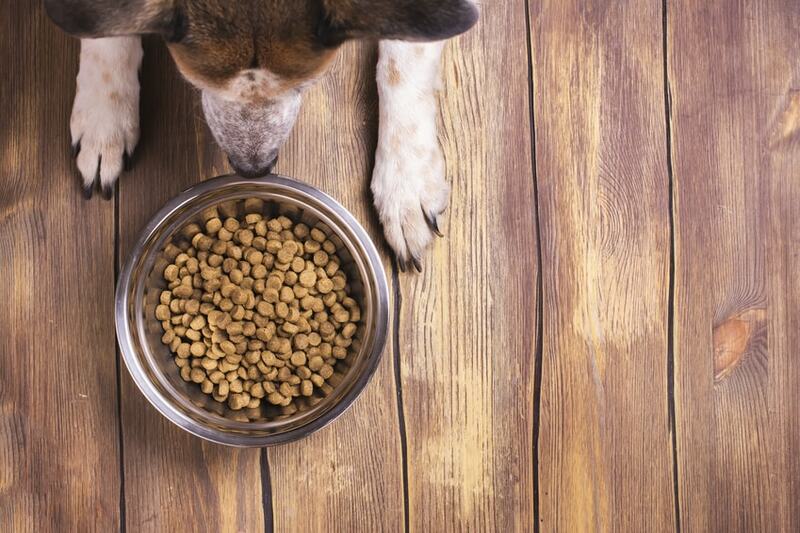 If your dog has an allergy or grain sensitivity, this may not be the right choice for him. Otherwise, it is a highly digestible dry food recipe. This Backcountry Chunky Lamb Dinner in Gravy Recipe is an all-natural, grain-free diet for dogs in all life stages. They market this product as an ancestral diet which means that it was formulated to mimic the natural evolutionary diet of wild dogs. An ancestral diet for dogs is meat- and protein-rich, made without grains or artificial additives. This formula features just five main ingredients with added supplements to ensure nutritional balance. It is also packed with natural flavor that your dog will love. The first ingredient in this recipe is deboned lamb, a high-quality source of animal protein. The second ingredient is beef broth which not only helps to maintain the high moisture content of this formula, but also contributes some natural flavor. There are several supplementary proteins used in this formula – deboned beef, lamb liver, and dried egg product. Dried peas also contain some plant-based protein, though they are primarily included as a source of grain-free carbohydrate in this formula. There are supplementary sources of carbohydrate energy and dietary fiber as well, including potato starch, dried citrus pulp, guar gum, and xanthan gum. The main source of fat in this formula is sunflower oil which works with the natural fat content of the meat ingredients to provide a balance of omega oils. This Merrick Backcountry Chunky Lamb Dinner in Gravy Recipe is formulated to meet the nutritional levels established by the AAFCO Nutrient Profiles for all life stages. Overall, this Backcountry Chunky Lamb Dinner in Gravy Recipe is an excellent source of nutrition for dogs in all life stages. Not only is it protein-rich, but it is full of natural meat flavor. This formula features dried peas as the main carbohydrate which makes this recipe grain-free as well as highly digestible. Though this formula is full of quality ingredients, there are two minor things that could be improved. As a plant-based fat, the sunflower oil offers limited bioavailability for dogs – an animal-based fat would be better. This formula could also benefit from the use of chelated minerals to ensure optimal nutrient absorption.